Two new titles that provide comprehensive coverage of the syllabus. 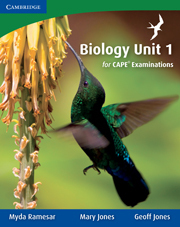 Biology Unit 1 for CAPE® Examinations provides comprehensive coverage of the CAPE® Biology syllabus. 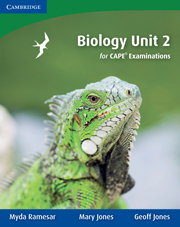 Written by highly experienced, internationally bestselling authors Mary and Geoff Jones and CAPE® Biology teacher and examiner Myda Ramesar, the book is in full colour and written in an accessible style. Learning objectives are presented at the beginning of each chapter, and to assist students preparing for the examination, each chapter is followed by questions in the style they will encounter on their examination papers.For more information and to order your Caribbean resources today, go to our How to order page.